A study by University of Wisconsin–Madison scientists Michael Eggen and Mutlu Ozdogan, now online at Environmental Research Letters, looked at yields of sorghum, a crop related to corn that is prized for its drought resistance. That phenomenon is already visible in the years with a strong El Niño, the thermal cycle in the Pacific Ocean that affects weather worldwide. As the climate as a whole warms, these droughts are likely to become both more common and more intense in Ethiopia’s highlands. The study had its roots in conversations that Eggen had in 2015 while working on a larger project on the relationship of agriculture to environment and climate in Ethiopia, a project led by Ozdogan, an associate professor of forest and wildlife ecology at UW–Madison. Sorghum is renowned in the area as a drought-resistant, subsistence crop, Eggen notes, “so when sorghum fails, it’s bad for everyone.” Eggen, who has now been working in Ethiopia for about 12 years and speaks “passable” Amharic, says sorghum is used for food, animal feed and brewing beer. “The farmers told us that the failure was because the rains had not come early in the growing season and the seedlings died or did not even emerge,” Eggen says. While examining climate records, Eggen and Ozdogan noted that the El Niño years generally had below average rainfall during the growing season, much like the forecasts for climate change — which also indicate that El Niños will become either more frequent, more intense, or both. 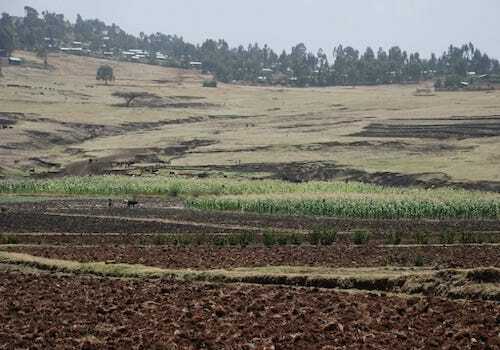 Although crop yield projections based on changes in average temperature and rainfall generally forecast more declines in tropical rather than temperate regions, portions of the Ethiopian Highlands have been expected to see the opposite trend, Eggen and Ozdogan explain. In that region, a warming climate with bountiful rains at high elevation might increase yields.